If Howard Morton and Freddie the Frog Killer were trying to hold you down so that Mary Lou Hutton could kiss you, you might run as fast as Jeremy Thatcher did the day he stumbled into Mr. Elives’ Magic Shop. And if you stumbled into that strange shop, you, too might be asked to make a choice. What would you buy? The Chinese rings? The Skull of Truth? Or the dragon’s egg? 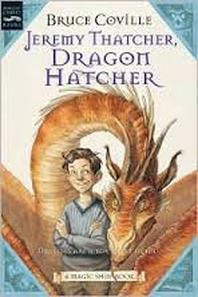 And if you did buy the dragon’s egg, what would you do when you found out you were supposed to hatch it? You can complete any of the challenge projects in your writing notebook, on a separate piece of paper, or using an appropriate app on your iPad. Chapter 1: Draw a picture of what you think Mr. Elives' shop looks like. Remember to include all the details. Write a descriptive paragraph to go with your drawing. Chapter 3 & 4: Draw a comic strip detailing the main events that occurred in these chapters. Chapter 5: Complete a VENN diagram showing how Jeremy and Mary Lou are alike and different. Think about what the characters say, think, act, and feel. Chapter 11: Write a letter to Mr. Kravitz persuading him to allow Jeremy to enter the art contest. Chapter 12 & 13: What could happen after the story is over? Write a brief summary of a sequel to the book.